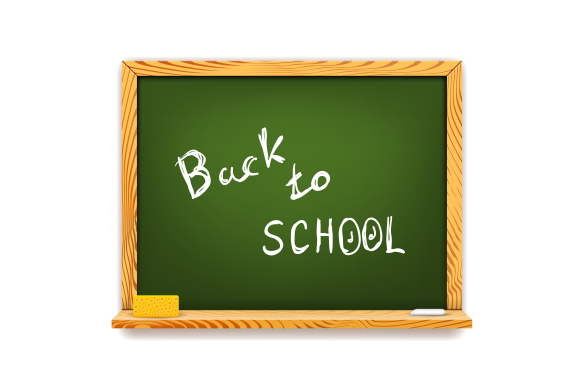 As a child I was always irritated by the endless parade of ‘Back to school’ signs in shops, seemingly taunting us all summer long, as if not wanting us to forget that these blissful carefree summer days would eventually be coming to an end. So perhaps I’ve carried this irritation into my adult life and this accounts for my feelings at the repeatedly tedious attempts at conversation with my child by friends, family and strangers alike. But today a woman, a complete stranger, passing us in the supermarket aisle, took things to a new level. “Are you going back to school on Monday?” she asks my child. Firstly, please have the goodness not to make uneducated guesses as to my feelings regarding my child’s imminent return to the box ticking factory that is our education system, and all the trials and tribulations this brings back into his life (and consequently, mine). This in contrast to the hours of free play on the street that have made up a good part of his 7 week break, punctuated by a few days here and there of Forest Schools, and hiking holidays, which in turn lead to more free play with new sets of children, around the caravan parks and hostels we stayed in. All this makes for a happy, carefree child. Why would I look forward to this happiness being doused by his return to school? Secondly, there’s this thing called ‘self esteem’ or ‘self worth’. And kids need this like plants need water. It seems this concept is rather alien to some, particularly those from a certain generation, to which I suspect this woman belongs. So let me spell it out: I want my child to feel loved, wanted, accepted and valued, not that he is a nuisance or an inconvenience of whose company I can’t wait to be rid. The latter is clearly the message this woman’s remarks were sending, whether intentionally or not. What’s more, her remarks to my child are a great example of an habitual lack of respect towards children that seems to continue to lurk in our society. Would she have spoken to an adult like that? What had my child done to her, what does she know of him, that she needs to express her dislike for him in this way? Just a flippant remark? Maybe, but children are not stupid, they are fully aware of the implications of our remarks about them, and will draw their own conclusions. And their feelings are liable to being hurt just in the same way as those of an adult, if anything, more so. I made the point of telling my child, in tones suitably audible, that on the contrary, I did not want him to go back to school, and that I would miss him, accompanying this with an affectionate hug and kiss. We then moved swiftly on down the aisle. Now believe me, I fully understand and sympathise with parents who are in fact looking forward to their children returning to school. And I don’t believe parents should feel guilty for feeling this way. There have been, and continue to be, plenty of times during my life as a parent when I have wished my child elsewhere. But if you are looking forward to school starting, please don’t presume I feel that way, and please, for pity’s sake, don’t tell your child you feel that way, and certainly not my child. When I picked my child up from his Woodcraft session last night he was horrible. I don’t know why. Maybe something had happened at the session to upset him. Maybe he was just tired. I thought about how it was going to be a nightmare getting him to bed. He was sulky, stroppy, rude, and a little aggressive. He was rude to my friend whilst we were giving her a lift home. Luckily she’s a good friend and on the same page as me when it comes to responding to my child, so I didn’t feel that usual pressure that can be felt when you feel you’re being judged, your child is being judged, and you feel you have to respond in a way that’s expected of you. And that way is so deeply ingrained in me I’m still fighting it all the time. I was angry, but had the presence of mind to be silent for a few moments before I spoke. It’s not an emergency. There’s no rush to respond. I spoke to him about it, asked him if he could tell me what was bothering him (he couldn’t), reminded him that it was OK to feel upset or cross, but not OK to be rude. But then there’s that part of me that still says I must show my child how angry I am, I must stay angry with him, I must make him feel bad about his behaviour, anything less would be letting him ‘get away with it’. I thought hard about this whilst we drove home. Then I thought about what my goal was – to let him feel loved unconditionally whatever his behaviour. But won’t this make him think it’s OK to behave in this way?And then I realised what rubbish this was, how this was the old responses talking. He already knew his behaviour was wrong. He already felt bad about it. There was really nothing left for me to do here other than help him to feel loved, supported and understood, and to move on. Shaming or scolding would really not be helpful or necessary, and would only make him feel worse than he already does.If he’s behaving badly he must feel badly. He needs love, not anger. So we made it through bedtime with affection, not anger. Using playfulness, not threats. Showing love, not disapproval. It was remarkably effective and so much better than the alternative. Bedtime was not a nightmare, because I’d been able to let go of my anger, and free myself of that pressure to act, to punish, to teach my child a lesson that didn’t need teaching. We reconnected, and I felt my child had learnt a much more powerful lesson than any punishment could teach, and I’d reminded myself of the folly of thinking that if I make my child feel bad he will suddenly see the error of his ways and somehow mature more quickly. My child is a bad loser. He gets very upset if he doesn’t win. At anything. I know this, so I was prepared for a lot of fuss if he didn’t win a prize in the raffle. I knew what responses I needed to give, and I knew the poor responses I can sometimes give when I’m out of patience, so I’d mentally prepared myself for the storm to come. You may think he was making a lot of fuss about nothing, and that by failing to tell him so, I was encouraging this. But it wasn’t nothing to him. If I’d said, “Don’t be so silly, stop making such a fuss” would this have made him feel any differently? Would he have said, “OK, actually you’re right Mum, I’ll stop crying now and forget about it”? Really? I don’t think so. So I validated his feelings – it’s nice to feel someone understands and is on your side when you’re feeling upset isn’t it? You may think I should have corrected his unreasonable claims that he never wins anything. But in the midst of that upset the rational part of his brain wasn’t functioning – my reasoning would only have fallen on deaf ears. He was merely expressing how he felt at that moment. You may think his behaviour was bad behaviour that needed to be punished or corrected. But I don’t see it that way. He was expressing his feelings, that’s all. They’re his feelings and he’s entitled to them, and I can’t make them go away. He was not pretending to be upset. He was. I wish he wouldn’t get so upset about these things, but he does. Since he can’t really help how he feels, to punish him would only teach him to suppress, not deal with, his feelings, and that the way he feels makes him a bad person. You may think I should have tried to cheer up or distract him instead of just allowing him to cry for so long. But this too would only brush his feelings under the carpet. If I had scolded or distracted him and stopped the crying sooner, this may have been desirable for me, it may have made me feel better, but it would have short-circuited my child’s ability to really deal with his feelings. The best way for him to learn to deal with these upsets, to develop the maturity and emotional intelligence we often wish children had, is to experience them fully. Then move on, in his own time. And you know what? That’s exactly what he did. Outside, in the car park, the bit you didn’t see. He dried his eyes, sighed, and starting talking happily about something else. He never mentioned it again. He didn’t even feel the need to tell his Dad about it when we got home. You may think this was proof that he wasn’t really upset – a common misconception about children. They experience things very much in the moment you see. They can swing from one extreme of emotion to another very rapidly. He was very upset at that time, he is not yet able to regulate his emotions, but as he was allowed to express and feel this upset, this enabled him to fully get over it and move on, And that’s what he needs to learn to do. In the meantime, I just need to be patient and be there for him. A loving, accepting presence. So if you were surprised or puzzled by my responses to my child, I hope this explains where I’m coming from. The responses may have seemed unusual to you since sadly, as a society, we have for many years misunderstood children’s developmental needs, and change is slow in coming about. Old responses and assumptions get passed down from one generation to the next, and it’s difficult to break that cycle. But even though my approach goes against the way I was brought up, and can attract the attention of strangers, I’m completely confident that it’s the right thing to do, and the right thing for my child. I first became aware of L.R.Knost’s writing when I came across her blog at Little Hearts/Gentle Parenting Resources – full of great articles and sound advice for parents – so I was very pleased when she contacted me asking me to take a look at her new book, “Whispers Through Time: Communication Through the Ages and Stages of Childhood“, which was released earlier this month. As the title suggests, the book moves through all the stages of childhood, from newborns right through to teens. But it focuses not just on how we communicate with children, but on our attitudes, perceptions, approaches and listening skills. Common problem areas such as dealing with tantrums, whining, teenage backtalk, tattlers or tell-tales, and lying are all covered, as well as many other areas like the importance of play and how to weave it into our daily routines, baby signing, and taking care of ourselves as parents. Do any of these passages resonate with you? Are there any ‘problem areas’ you’d like more help with? Leave a comment for a chance to win a free copy of the book! 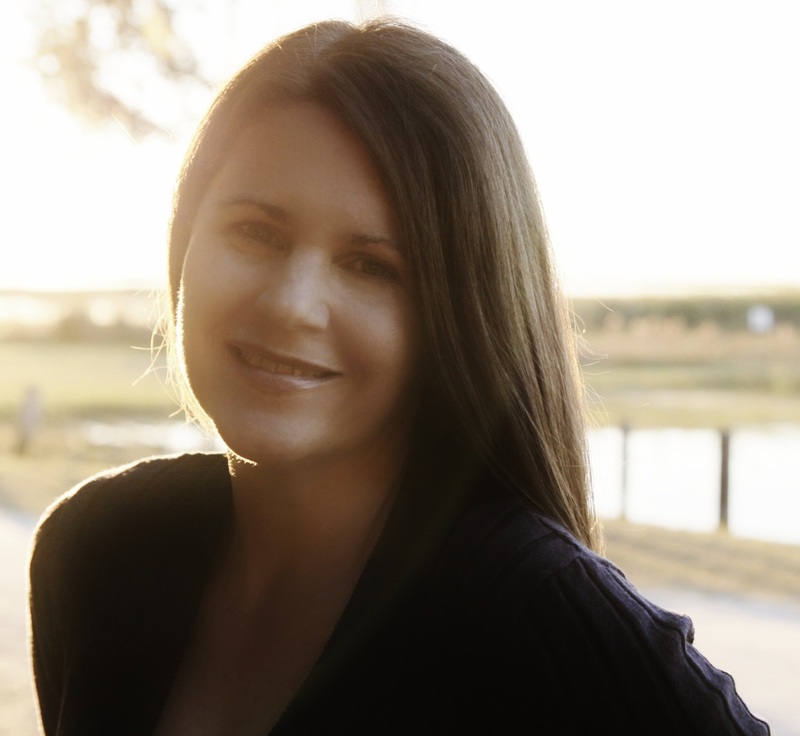 L.R.Knost, is an independent child development researcher and founder and director of the advocacy and consulting group, Little Hearts/Gentle Parenting Resources. A mother of six, her children range from 25- years down to 25-months-old. Two Thousand Kisses a Day: Gentle Parenting Through the Ages and Stages and Whispers Through Time: Communication Through the Ages and Stages of Childhood are the first in her Little Hearts Handbooks series of parenting guides. The next book in the series, The Gentle Parent: Positive, Practical, Effective Discipline is due to be released November 2013. Other works by this award-winning author include the children’s picture books A Walk in the Clouds, Petey’s Listening Ears, and the soon-to-be-released Grumpykins series for ages 2 to 6, which are humorous and engaging tools for parents, teachers, and caregivers to use in implementing gentle parenting techniques in their homes and schools. 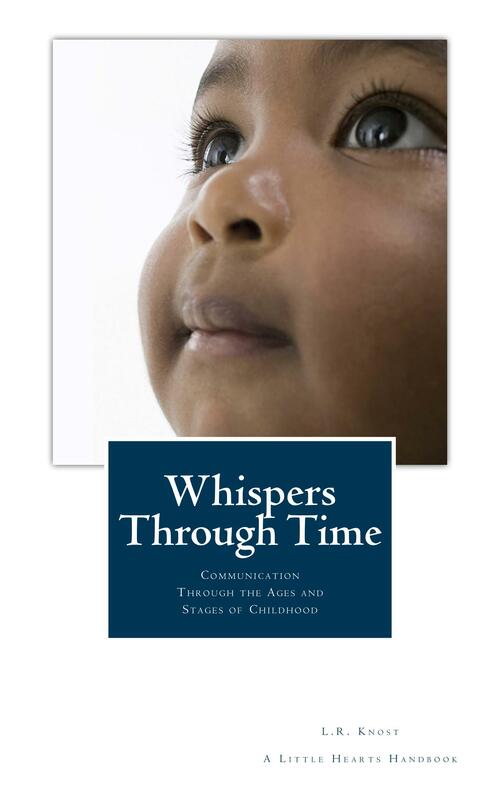 This post is part of the Virtual Book Tour for the launch of L.R.Knost’s newest release Whispers Through Time: Communication Through the Ages and Stages of Childhood. Click here if you’d like to check out all of the other stops on the tour! Today my six year old child dropped his spoon on the floor whilst we were eating breakfast. Some milk also ended up on the floor. I was annoyed. It wouldn’t have happened if he hadn’t been messing around, I thought. I thought. I nearly said. But I stopped myself. He wasn’t ‘misbehaving’. He was just chatting and singing, not sitting still. Being a normal, lively 6 year old boy really. But the old response, the response I grew up with, still sounded in my head, in response to my annoyance. “Look what you’ve done! Stop messing around and sit still. You always make such a mess.” etc etc. I could see him looking at me for my reaction, fearing my disapproval. I made a comment about the spoon doing a somersault. He looked relieved and smiled, but he didn’t pick it up immediately. The words ‘Pick it up then’ sounded in my head, but again, I suppressed them. He picked it up a few moments later without prompting. I have a general rule that I try to use in these situations. Often I fail, but I try. It is to speak to my child as if he is an adult, a friend or a guest. OK, OK, he’s not any of these things, but does he deserve any less respect? Think about it this way. If you were eating with a friend and they accidently dropped their spoon, what would you say? Certainly none of the words that popped into my head in the above example. And if you did, it would be unlikely you’d remain friends for long. If you listen carefully, you hear this all the time. My child arrived for his gymnastics class and having signed in with one of the organisers he proceeded towards the gym, but forgot to take his shoes off first. “Take your shoes off then“, the supervisor said. Not the worst thing in the world, I know, but again, would you speak like this to an adult? Or would you gently say, “Don’t forget your shoes“, or simply, “Shoes“? 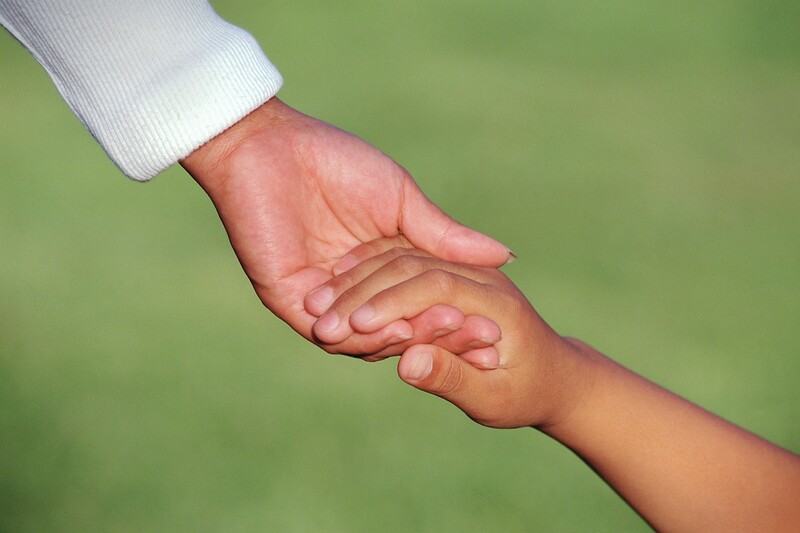 Why do we habitually speak any less kindly to our children? The problem is that apart from not being very conducive to building a healthy relationship with our children, these responses communicate a great deal to children, none of it positive. If instead of saying gently, “Don’t forget your shoes”, we say impatiently, “Take your shoes off then”, we don’t just remind our children to take their shoes off, we imply that they’re stupid or forgetful. Sound over the top? I think not. Believe me, I know. Children are acutely aware of our tone, our moods, our choice of words, and any implications these might have. Not much passes them by. If a child is habitually spoken to in this way all day every day for years, it’s going to have an effect, particularly on self esteem, and again, it’s not a positive one. What’s more, if we want our children to speak respectfully and kindly to others, the number one way we can teach this is by speaking respectfully and kindly to them. Modelling the behaviour we wish to see. It can take practise and time to change old habits, and like I said, I don’t always succeed. But at least I know if I slip up it’s just that – a slip up. It’s not the way I talk to my child all day every day. For more on this topic, read Adele Faber & Elaine Mazlish’s “How To Talk So Kids Will Listen & Listen So Kids Will Talk”. One of the most universally misunderstood and mishandled areas of parenting and dealing with young children must surely be our responses to their tears, cries or upsets. I’ve become increasingly aware of how intolerant we seem to be, as if children’s cries are something to either fear, or loath. Yet crying is both natural and necessary. Don’t try to ‘fix it’ or make it better. When our children get upset about something – a fall, a disappointment, something getting broken or spilled – our instinct is to protect them from their sadness or painful feelings. We try to fix things for them, to rationalise, to cheer them up or distract them from whatever it is that’s upset them. “Never mind, we can go tomorrow instead”, “You’re not hurt”, “We can build another tower”, “It doesn’t matter”…. But these well-meaning efforts short-circuit a child’s ability to express their feelings, to learn to deal with them, to heal, and to move on. Like the time my child cried because he fell over in the mud. Often he would laugh and not care about something like this. But this time he cried. Perhaps he was tired or hungry, or something else was bothering him, and he just wasn’t in the mood for this. Perhaps falling in the mud was just a trigger for some other pent-up feelings. Either way, he needed the chance to have a cry. There’s nothing wrong with that. No need to try to distract him or cheer him up with jokes or distractions, or telling him that it doesn’t matter if he’s muddy. Just some empathy and a cuddle was all that was needed. He got over it quickly enough, and got over it knowing that his feelings about it were acceptable, that he was entitled to them. And he felt better having had a cry. Don’t we all? Children will get upset from time to time, probably quite often actually. And that’s OK. That’s because they’re just children. We simply can’t protect them from every upset. Rather, our job is to help them deal with their feelings, not smother them. Don’t treat crying as bad behaviour. This seems to be deeply entrenched in our society’s attitude towards children. 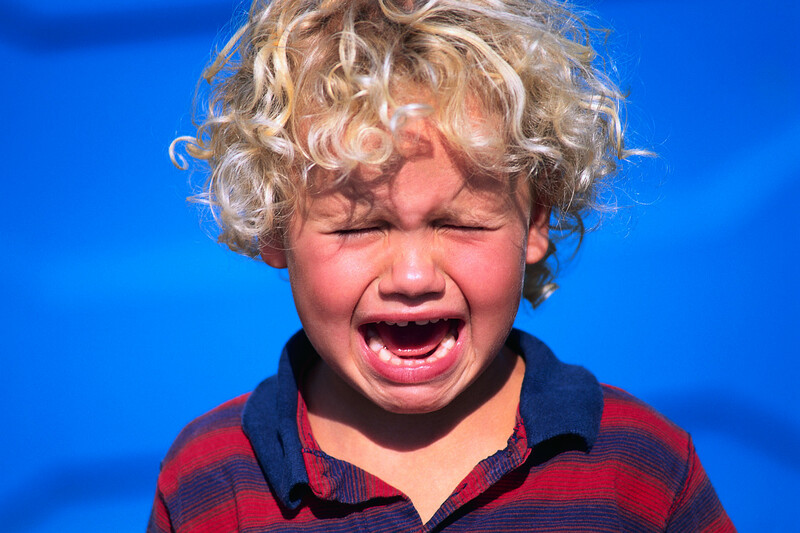 When a child is crying because they can’t have what they want, or when the parent perceives it to be about something they consider to be silly, unimportant or unjustified, we treat their crying as bad behaviour, and try to threaten or scold them into silence, ignore them or send them to their room. Parents seem to assume that their child is not really upset, but just making a lot of noise simply because they’re “being silly” or making a deliberate attempt to drive them crazy or to manipulate them into giving them what they want – a toy, a treat, a trip to the playground, an immediate departure from the supermarket. 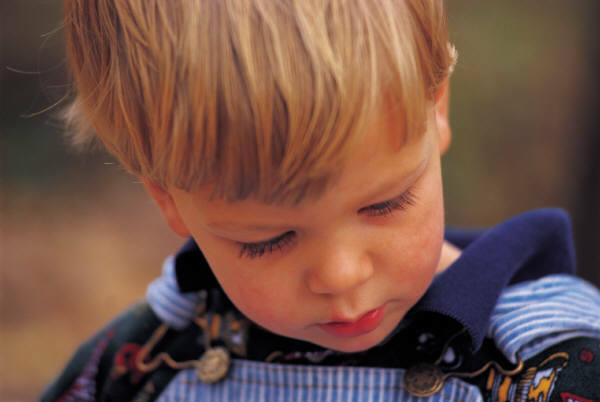 We may perceive a child to be “not really crying” or “just trying to get their own way”. There may not be tears, but there are still feelings to express. Anger, frustration, powerlessness or disappointment are all valid feelings, and a child must be allowed to feel them and express them in order to learn how to deal with them. What seems insignificant to us may really seem like the end of the world to a child. OK, adults don’t burst into tears every time things don’t go their way. But children are not adults, and as such cannot be expected to behave like them, and certainly can’t be threatened or scolded into behaving like them. All feelings are valid and all feelings should be allowed. But what about when a child’s crying over something you’ve said no to? 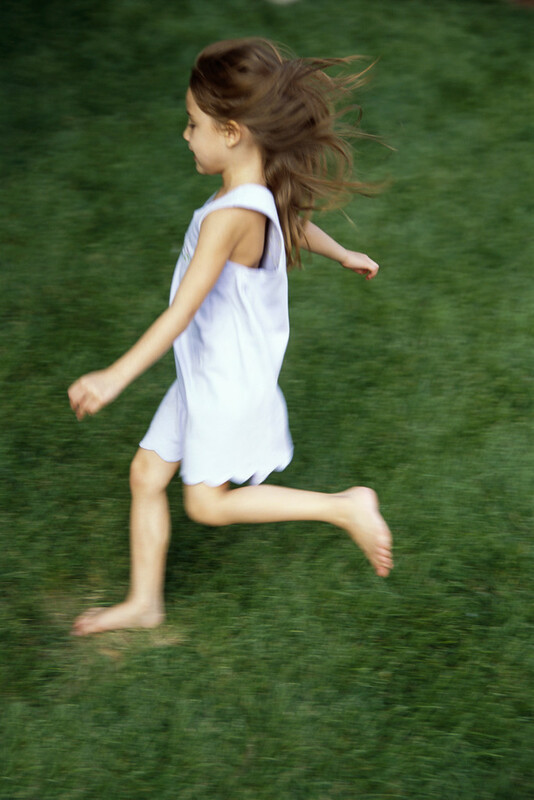 Children can’t have what they want all the time and we can’t give in to them when they make a fuss about it. True. But here’s the thing; it is quite possible to validate and empathise with a child’s feelings without giving in to their demands. “You’re really frustrated that you can’t have a cookie right now. You don’t want to wait until after dinner. It’s so hard to wait”. Child feels validated, and feels a little less like you’re the big baddy. But cookie still remains in cookie jar. It’s OK for children to cry. We tend to assume that all crying must be stopped as quickly as possible. But crying is a natural healer, tears a natural outlet for our emotions. Children can’t be expected to never cry, any more than adults. So what are we so scared of? Letting a child’s tears flow whilst offering them the comfort of our calm and loving presence can be a great opportunity to strengthen that all important connection. You are currently browsing the archives for the Connection; being an attuned parent category.